This past July, I had the honor of serving as Toastmaster at NECon 38. Everyone just refers to the event as “Necon” because the conference has been around for thirty-eight years. Quick explanation: the North East Conference is for authors, publishers, genre sellers and enthusiasts, illustrators, and other creative folk. It’s a relatively casual con’ with a tight schedule of panels and events built on its years of tradition. There’s always a Guest of Honor—or two, or three; a GOH artist, Legends, and a Toastmaster. Which is where I came in this year. One of the things I set out to do—in addition to some background sleuthing and Internet creeping—was to read. I knew I wasn’t going to be able to get through their copious oeuvres: Cameron has several novels and multiple short stories, Wellington is the same, and Marshall is a short story enthusiast with four collections and many short stories out in the wild. These are the three novels I chose to read. SEVEN KINDS OF HELL is Cameron’s first book in a modern fantasy series that blends history, archeology, and divided, but hidden, supernatural species called “fangborn.” The series follows young archeologist Zoe Miller. She’s been plagued for most of her life by episodes where, under stress and in the presence of evil, she believes she’s imagined becoming a wolf and…dealing with the problem. This is exacerbated by an absentee father and a mother who seems to be on the run. The book opens with her mother’s death and Zoe’s spiral into the world and conflicts of the fangborn. I’ve read plenty of modern fantasy novels and series featuring enhanced, former humans and spooky supernatural goings on. “Seven Kinds…” fits right in. It’s a fast-paced, globe-trotting race to secure items of power. For Zoe, her personal challenge is accepting the most controversial aspects of her heritage and, of course, her role in this ancient power play. Frankly, I enjoyed the character. She fits the archetype of the heroine in modern fantasy books such as this, but that’s not who she is. It’s her experience—successes and failures—that are the highlight of this book, the character herself was a joy to follow along with as she grew and changed from the first page to the last. 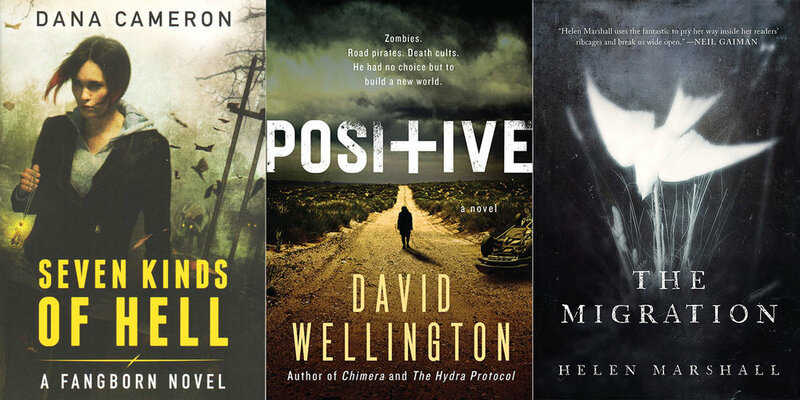 POSITIVE is one of at least four zombie novels that Wellington has written. His rise began with the near-accidental serialization of his first novel on a blog that his friend had stopped using. Serendipitous. Walking dead stories are generally lumped into a horror category, but they probably best fit within science-fiction, Wellington’s first love. In “Positive,” Wellington’s hook is that he’s following a character who has grown up post-apocalypse. Only one generation removed, Finnegan lives on the blasted isle of Manhattan with his family and others in a few high-rises. They fish, they farm, they survive. ‘Positive’ refers to victims of the virus that has scorched the world. Exposure means twenty-years of uncertainty as the virus runs its course. The result is a hyper-aggressive human that craves the consumption of flesh. As mentioned above, Finn is a product of this world after the fall. His perspective, awareness, and learnings are informed directly by this. There are still plenty of people—such as his parents—who remember what life was like before. This is where Wellington’s novel shines. The story is being recounted by Finn in the past tense. Often, this means something of a spoiler since the reader knows the protagonist survives. However, we have no idea what condition Finn is in or how he survived. When his mother succumbs to the virus, Finn is doused in her blood when she’s killed. The community flies into a panic and turns Finn and his best friend over to the military authority that has been trying to restore order since the fall. Part of his sentence is to have a large plus sign tattooed on the back of his left hand. In handing Finn over, his story truly begins as he learns how the military deals with positives and what other factions populate what’s left of America. All of this is from Finn’s post-apocalyptic perspective and we get to follow Finn as he learns, as he grows, and this is the most satisfying aspect of the book, in face of the trials he must overcome. Wellington populated the novel with an awful reality of hunger, misperceptions, fear, and opportunism, but his handling of Finn is the catalyst of change in the story. I’m sure plenty of readers will see a critique of our current political systems and cultures—and rightly so—but, in my honest opinion, the story shines a light on our current shortcomings as much as it considers what might be. Wellington does the zombie genre proud by keeping the threat of zombies in the background and exploring humanity’s progress or lack thereof through the eyes of Finn. Go forth and read it! THE MIGRATION is Marshall’s first novel—which isn’t obvious, considering the quality. (I read an ARC, the novel is commercially available in March 2019, according to amazon.ca) She’s the author of four collections and a multitude of short stories elsewhere. She’s also a medievalist with a PhD and her fiction has won several awards. I only mention this because she’s very good at what she does precisely because she pours her life and her experiences into her writing that produces some stunning stories that easily defy categorization. Weird and bizarre come to mind, but they miss the mark, as do horror, science-fiction, or fantasy. Let’s just call it speculative fiction and be done with it. “The Migration” is no exception. The story follows a young woman, Sophie, and her family. Her younger sister, Kira, has contracted a disease that is spreading around the world amongst the younger generations. Her mother and father have separated and her mother has moved them back to her country of origin, England, where there appears to have been some progress identifying and treating the disease. Nothing is as it seems, of course, as Sophie learns the hard truth of their situation between the historical knowledge of her historical epidemiologist aunt and the doctor treating Kira. In the meantime, the weather itself seems to have turned against humanity’s survival and the whispers of death afflict those who’ve contracted the virus. Marshall is masterful at conveying the ties that bind us in humanity, the bonds of family and friendship. Her world-building is incredibly personal and all too real. In this debut novel, she explores the fraying of those ties, the building of new ones, and the courage of our younger generations. Sophie is dogged in her pursuit of the truth despite just about every adult in her life trying to dissuade her. This was a lovely, strange, and harrowing tale. I highly recommend it. Older PostPerhaps a metaphor might help?